In this guide, you’ll learn how to implement Lead Scoring in ManyChat so you can figure out which subscribers are engaged and which are not. The goal of lead scoring is to figure out which subscribers of your Messenger Bot are ready to buy and which ones need further nurturing. This is also called explicit scoring. With positive behavior, we increase the lead score, with negative behavior we decrease the lead score. Here are some positive examples of when we increase the lead score. And some negative ones when we decrease the lead score. All these actions will give you a total score. And this score will tell you exactly how engaged someone is. And if they’re ready to buy or if they need further nurturing. So after a while, your subscriber’s lead score is getting higher and higher. Until it’s so high that it’s likely that they’re ready to buy your product or service. That’s what I call the “Threshold”. And when someone reaches that Threshold, we, for example, invite them for a webinar or Coaching Call. Figuring out what that Threshold is more an art than a science and is really different for every business. For some that threshold is 83. Many marketers take 100 as a starting point and then adapt from there. But really, it’s a bit hard (especially in the beginning). But if you figure it out, it will make your marketing a bit easier again. ManyChat made it really easy to set up Lead Scoring. You first have to go over to Settings » Custom Fields. And then create a new Custom Field called “Lead Score” and make sure you set the type to “Number”. Then, in the flows, we’re going to create some actions to set the lead score. In this example, we want to increase the Lead Score of people who say the video is awesome. Add action » Set Custom Field » choose custom field we just created » Increase the number by 2. Now we want to decrease the score by 2 of people who say it’s total crap. Add action » Set Custom Field » choose custom field we just created » Decrease the number by 2. 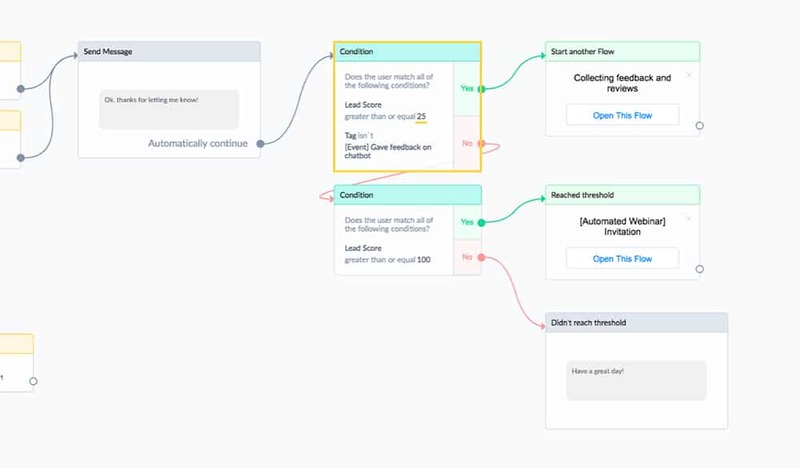 You simply add the actions in the flows and based on how they interact with it you increase or decrease the Lead Score custom field..
After that, you continue the conversation like you always would. Here’s another example of increasing your subscriber’s lead score when they click a button to your landing page. And another example when you want to increase their score at the end of the conversation, but there’s nothing for them to click anymore. The method above shows how you can increase or decrease the Lead Score based on how they respond in that conversation. This is awesome, and I totally recommend you to do this. 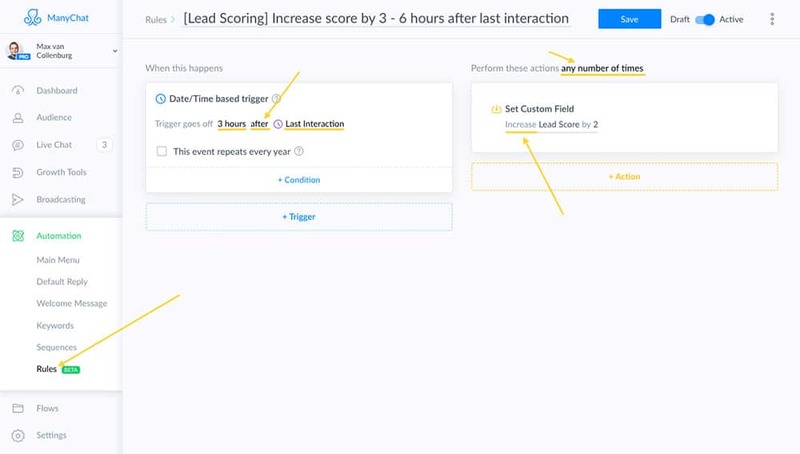 But I found another little trick which can help you to automate parts of your Lead Scoring. I, for example, wanted to increase the Lead Score everytime the subscriber interacts with my Messenger Bot. That’s why I’ve set up a rule to do just that. As you see in the image above, the score will be increased 3 hours after the last interaction. 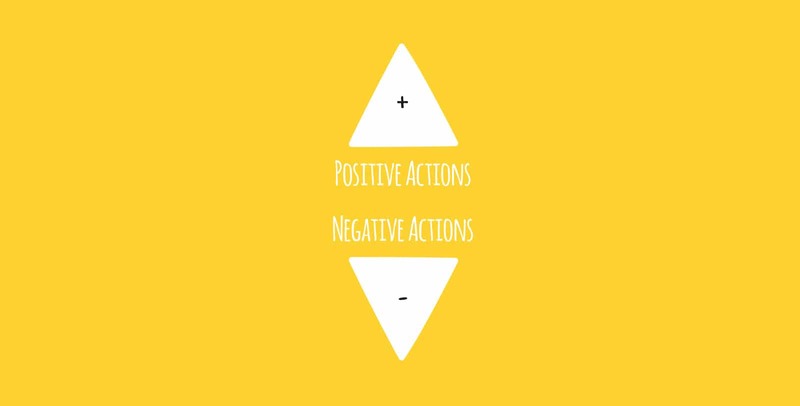 This is perfect because this way you don’t have to add all lot of actions inside your flows only for when someone is interacting with your flow. We set it for 3 hours because if we would set it to 1 minute there would be too many points collected if they just talk for a few minutes to your Messenger Bot. Earlier we talked about how to figure out your threshold. But what do you do when people hit that number? I quickly mention you can invite people to a webinar or coaching call. You’ve something cool coming up. A big promotion for example. And you want to let your subscribers know. But it would be a bit pushy if you would already try to sell to people who just know you. They are much more likely to think it’s spam and you could potentially even get your page blocked. That’s why we want to send the broadcast only to subscriber’s who’s lead score is equal or higher than 25. To do this we have to set the targeting of our broadcast. You select “great than or equal” and set it to 25. Just keep in mind you can’t send any promotional content to subscribers who didn’t interact for 24 hours with your Messenger Bot. So be sure to send something valuable first. Something that helps your subscriber. Like a tip, trick or tutorial. Then be sure to set the type to “Promotional Broadcast” and ManyChat will handle this for you. You can read more about Facebook their policies about sending promotional content here. I’m using this one most. I share constant value with my subscribers. And if they reach a certain threshold I invite them to a webinar. I do that by checking at the end of the conversation if they reached my threshold. See how I use the condition to check if the lead score is greater than or equal to 100? If the lead score of the subscriber is 100 or more I invite them to my webinar. And if it’s still below 100 I just wish them a nice day and continue by providing value untill they reach 100. I like to ask subscribers for feedback. I always get lots of good ideas from it and learn how to improve the user experience. This works similar to the previous example. You insert a condition and check if the subscriber has the desired lead score (in this example 25 or higher). If you implement this, also make sure to add a tag to people who gave feedback. Another thing you could do is to start an email campaign. You create a rule for when a subscriber his or her lead score reaches 75 (or higher). And then you push them into an automation with the emails you want to send. I’m using ActiveCampaign (affiliate link), but you can do this with almost any smart email service provider. 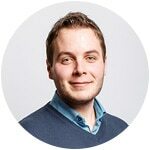 Are you going to implement lead scoring in ManyChat? We’re starting a project now where we will build a lead / score based chat bot. 1. Our bot will have the subscribers to answer daily questions and engagement topics to get leads / points / score. Is it possible to subscribe as a team? Let people collect points with other for their teams? 2. We also want to make a live top 5 scoreboard where all the subscribers can see the top 5 teams with the best score. Do you know it this is possible at all? I think it’s possible, but it’s rather complicated. You first have to ask subscribers to share something with their team, when the team members opt-in you store all their ManyChat ID’s into Custom Field(s) of every team member. Then, when someone gets a point you can increase everyone their score by 1 if you use ManyChat their API. Good luck! Hope you can figure it out. Sounds like a cool idea!